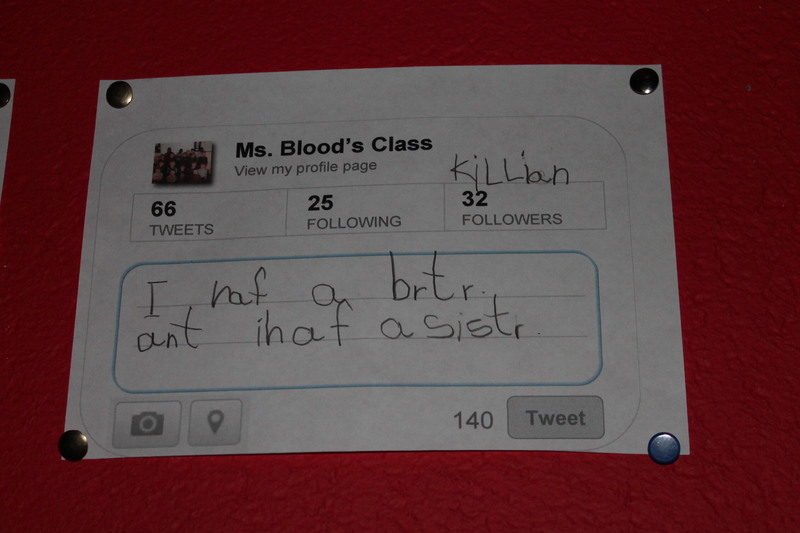 At the beginning of the year Room 2 started our own Twitter account ( @MsBloodsClass ). Initially most children hadn’t heard of Twitter but I was able to give them an idea of its functions by likening it to Facebook as many of their parents or older siblings were active on Facebook. 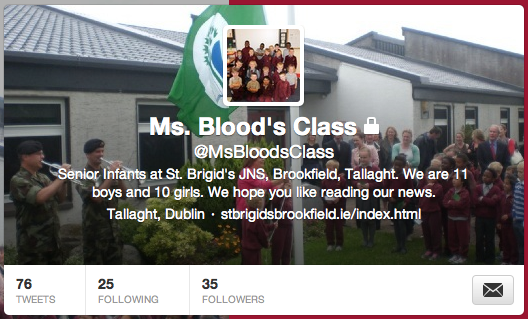 I found a handful of other tweeting classes to follow – Senior Infant classes, as well as some Junior Infants/ First Class, and even some classes of a similar age group in other countries. In the early days, when I mentioned checking Twitter for any news, many of the children were ambivalent, as they really had not yet begun to engage with it. In truth, I think many of the children still weren’t sure WHY we were on Twitter or what it was for. Since then, the value of Twitter to us as a learning tool has grown and continues to grow over time. Twitter provides us with a window into classes that are different from ours – the children are intrigued by the news posted by children in classrooms in which there are only boys, or only girls; no uniforms; or two classes in one room. Their interest is piqued and their curiosity kicks in. They have a real link to the outside world and are learning to appreciate the diversity in the world. 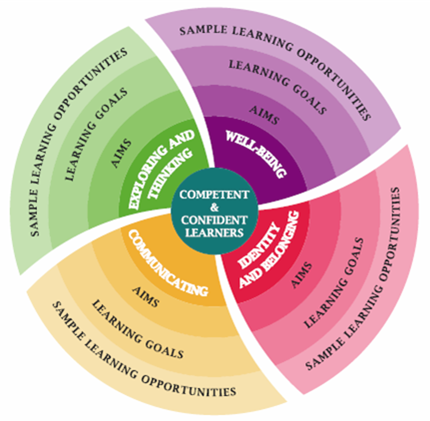 Many of the Learning Goals set out in the Aistear themes of Identity and Belonging, Communicating, and Exploring and Thinking are addressed in our Twitter time, and this broadening of our horizons also speaks to several strands within the Geography and SPHE curricula. Over time, the children have begun to engage more and more with Twitter and now regularly suggest that we post a piece of news to Twitter, or check whether we’ve received a reply from another class that we’ve tweeted. Some of their parents have begun to follow our account and I feel that both they and I have benefited from this avenue of communication. Twitter provides me with an opportunity to share pictures and videos of what we’ve been doing and it also gives parents a chance to discuss current learning with their child at home. I feel that this is a particular advantage in the Infant classes when the child has often forgotten the day’s events before they get home to discuss it with their parents! In terms of the daily logistics of fitting Twitter into the packed school day, initially I struggled. We have now settled into a routine of checking Twitter during our lunch/ snack breaks. I am happy with this system as the children recognise it as a leisure activity, rather than part of our ‘work’ – though of course the Literacy benefits of reading and replying to tweets should not be underestimated. While at the beginning of the year I typed all of our updates, I now try to give the children an opportunity to type an update – this is a real challenge for them as they struggle to find letters on the keyboard, with the added difficulty of the letters being capital, which we have only just begun to learn! Now when I open Twitter, there comes a chorus of voices, each asking me to read out a different tweet. The children are attracted by the avatars (profile pictures) of the other classes we follow, and so usually ask to focus on the tweets of colourful profiles first! We always really enjoy tweets with pictures and have been able to peek at the Aistear learning going on in several classes this way. I would strongly recommend to any teacher to use this easy and interactive method of integrating ICT into the school day. 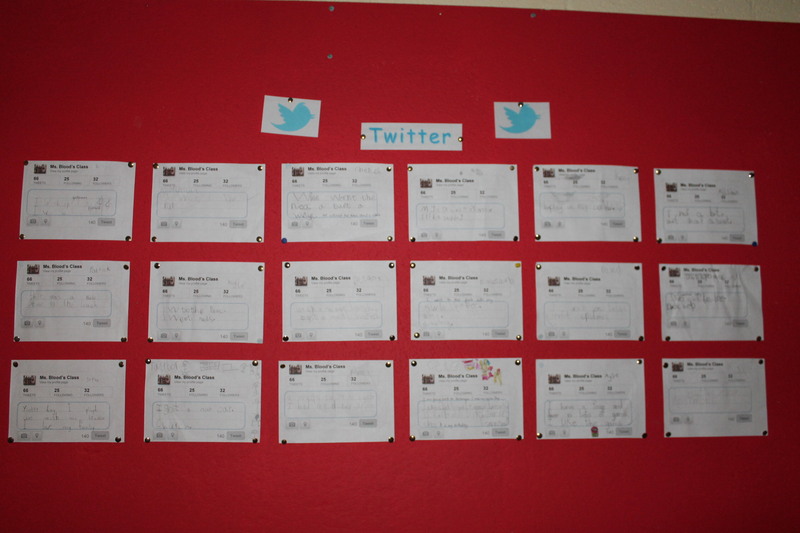 The children wrote their own news on a Twitter template and we posted it on a noticeboard in the corridor.